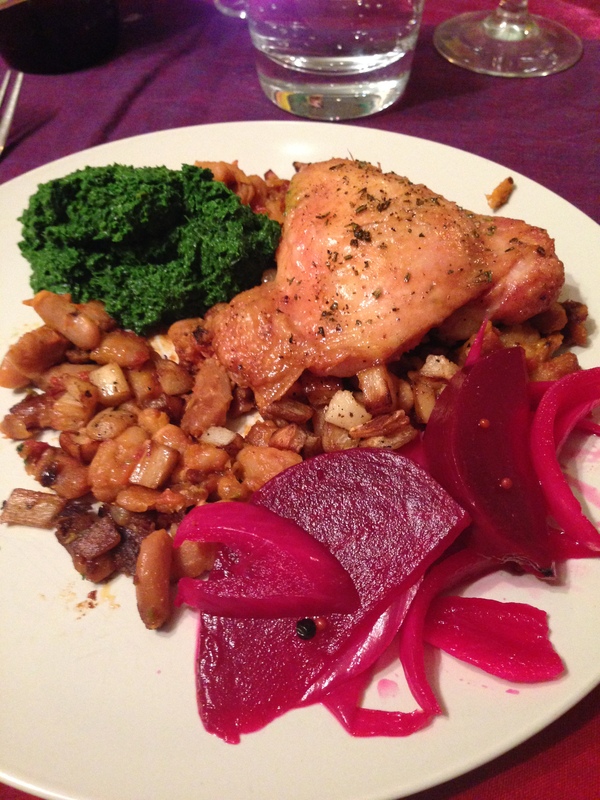 Roast chicken with braised cannellini beans, carmelized parsnips, kale pesto, and pickled beets and red onions. Plus stuffed pickled peppers. dessert: peach crisp with vanilla ice cream, courtesy of one of my lovely and talented friends. The main is actually several different recipes. So it’s pretty involved. But omg — it was so unbelievably good. And while you definitely have to plan ahead, nothing is difficult. Plus, this is one of the few times where I think canned beans would be fine. So I encourage you to make this, or some version of this. Then report back and tell me if it is the best thing you’ve ever had. Here are recipes. First, the peppers. This isn’t so much a recipe as directions for one of the easiest appetizers ever. You buy the pickled peppers from somewhere that has them (I got these from the olive bar at Whole Foods). 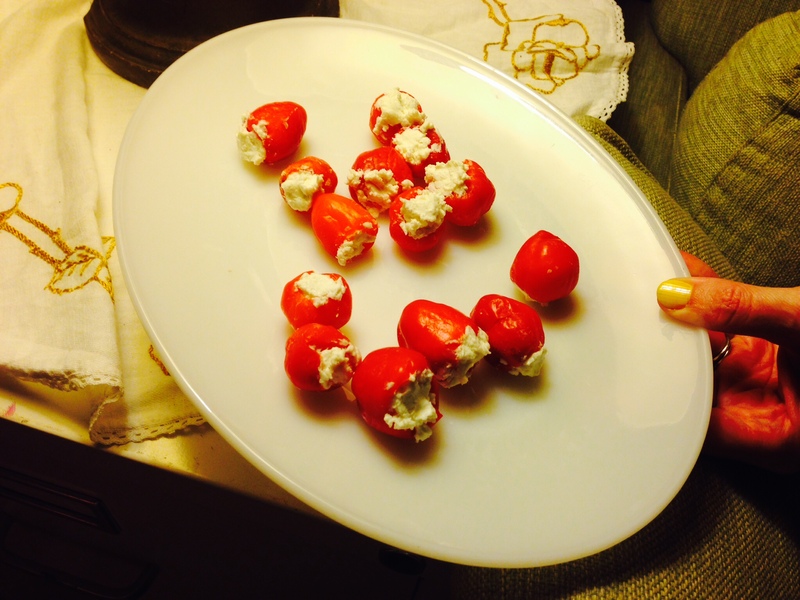 Stuff the peppers with goat cheese. Done. Second, the chicken, which again is not really a recipe. I used chicken thighs plus one boneless, skinless breast. Wash the chicken then pat it dry. Toss in a bowl with a couple of tablespoons of olive oil, sea salt, and freshly ground pepper. Arrange on racks set on jelly roll pans. (I had five pieces of chicken on each pan. So you may only need the one pan.) Preheat the oven to 450. Let the chicken sit out while the oven is preheating, so it will season with the salt and come closer to room temperature. Sprinkle some fresh chopped rosemary over the top then slide it in the oven. Cook for about 45 minutes, rotating top to bottom and back to front about halfway through, until the skin is crisp. Third, the parsnips. Again, not a recipe. Peel parsnips (I used five) and dice into pieces a little larger than 1/2 inch. Melt some butter in a cast iron skillet. Sprinkle with sea salt and pepper, then saute over medium high heat for ten or fifteen minutes, tossing occasionally. Set aside. After you turn the chicken, put the parsnips into the jelly roll pan and let them crisp up and absorb some juices. Unless there is a lot of rendered fat in the bottom of your pan, in which case maybe skip this step. It’s just a bonus. Fourth, the pickled beets and onions. This recipe is from Saltie: A cookbook. I love this cookbook so much that I literally read it from cover to cover. Because it’s compulsively readable. You really feel like you get to know the authors and that if you lived in Brooklyn, you would want them to be your friends. Especially after making a couple of their recipes. So good! I deviated a little bit from the original, but only by cutting down the sugar and combining beets and red onions. Preheat the oven to 400°F. Put the beets in a roasting pan. Add just enough water to the pan to evenly cover the bottom. Cover with aluminum foil and roast until tender when pierced with a knife, about an hour, depending on the size. Let cool until you can handle them, then peel the beets, slipping the skins off with your fingers or a kitchen towel and using a paring knife where they stick. Slice into ½” wedges, then put in a large, heatproof bowl. In a saucepan, combine the vinegar, water, sugar, salt, and spices and bring to a boil over medium-high heat, stirring to dissolve the sugar and salt. When the sugar and salt have dissolved, remove the pot from the heat and add the onions, Stir to combine. Then add the beets and let everything cool to room temperature. Once cool, transfer to (preferably glass) container, cover, and refrigerate. The pickled beets will be ready to eat the next day and will keep for up to 2 months. And finally. The beans. The idea for these started with a recipe for slow-roasted pork shoulder with garlic-rosemary beans from Cooking Slow, by Andrew Schloss. 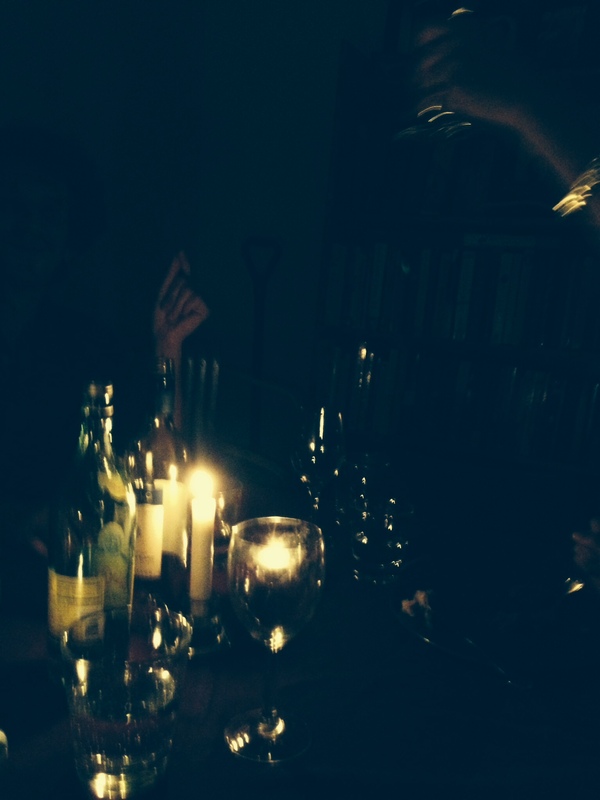 I made it a couple of weeks ago as a test for the dinner party. The pork was delicious. But it was the beans that blew my mind. The original recipe calls for canned beans, but of course I cooked mine from scratch. Because I didn’t see how they could possibly hold their shape, I decided to brine. But I digress. The point is the finished project. They were incredible. Firm and meaty and infused with all the flavors of tomatoes, pork, garlic, and rosemary. Seriously delicious. But heavy and not what I wanted to serve. So I continued thinking. Reading. And came across a recipe from Gluten Free Girl and the Chef for beans braised in olive oil. Which sounded good. But a little over the top for what I was looking for. So I decided to experiment. Here’s what I did. 1. Brine the beans over night by adding about a tablespoon of salt to the water, stirring until the salt is dissolved, and then adding the beans. Rinse, cover with water, and add the kombu. Bring to a boil then reduce the heat, partially cover, and simmer for about an hour or until the beans are tender. It’s okay if they split. But you don’t want them mushy. When the beans are cooked, add a teaspoon or so of sea salt and let them cool in the cooking liquid. 2. Once the beans have cooled, transfer to a dutch oven or slow cooker. Heat the olive oil in a skillet over medium heat. Saute the onion for a couple of minutes, then add the garlic and rosemary. Cook for another minute or two then add the onion mixture to the beans. Finally, add the beans and chicken broth or water. Make sure the liquid covers the beans by an inch or so; if it doesn’t, add more. Cover and cook. If you’re using the slow cooker, set for 12 hours on low. If you’re using the dutch oven, use the oven. To be honest, I did both. I started in the slow cooker, not just all day but all night. But there was still liquid on top and beans hadn’t turned dark and meaty. So I wound up transferring to a dutch oven and cooking for another hour or two at 400. They were perfect. Next time I’ll probably start with the oven. But we’ll see. Playing is fun. 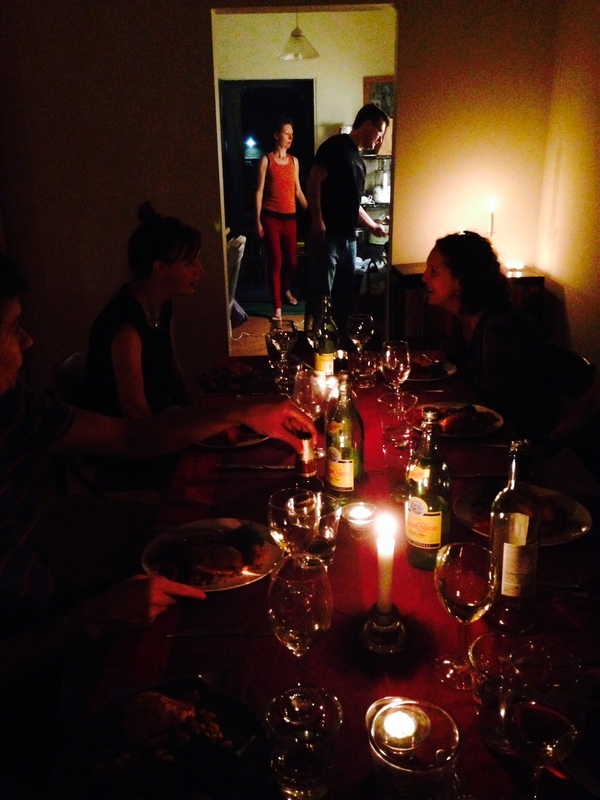 As is cooking for and eating with people you love. To serve, scoop about a cup of beans and arrange them around the plate, randomly, leaving spaces. Sprinkle a smaller spoonful of parsnips over the beans. 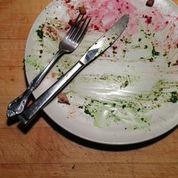 Fill some of the empty space with kale pesto, pickled beets and red onions, and chicken. Eat. Enjoy.